The WMF 9000 F automatic filter coffee machine combines high performance, excellent coffee quality, and user-friendly operation. It offers a variety of innovative features to satisfy the requirements of the mass catering sector. 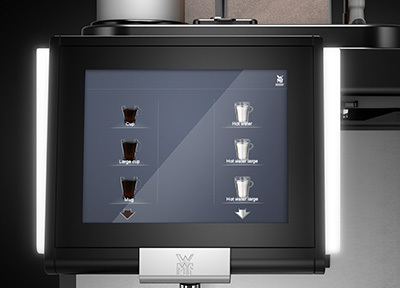 Naturally, both versions of this fully automated filter coffee machine share the premium materials, advanced technology, and robust construction you expect from WMF, ensuring many years of reliable and profitable service. 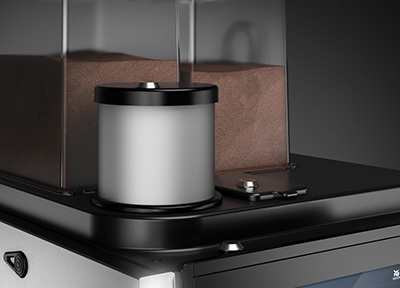 The brewing arm dispenses the coffee in brewing batches of 1 to 5 litres into a heated external thermal container with automatic brewing. In this case, the brewing quantity can be up to 40 litres, depending on the size of the container. Based on the requirements of mass catering, this version of the WMF 9000 F supplies an additional brewing quantity of up to 100 litres per hour to an external container with automatic brewing. This makes it particularly suitable for locations with a high coffee consumption. With two 2.5 kg hoppers available, you have the opportunity to offer two different types of ground coffee, for example regular and decaffeinated. But if you choose to use only one type, you can take advantage of twice the capacity - especially useful at peak times. *** Usual pressure losses through the water connection set and water filter are considered, so that the machine flow pressure of 0.2 MPa (2 bar) at 6 l/min, that is required for the max. hourly output, is secured.